U.S. Secretary of State Mike Pompeo shakes hands with Ambassador Reem Al-Khaled, as he arrives at Kuwait International Airport in Kuwait City, Kuwait, March 19, 2019. U.S. Secretary of State Mike Pompeo headed to the Middle East Tuesday for regional security talks in Kuwait, Israel and Lebanon as Washington looks to draw new support in its opposition to Iranian aggression. 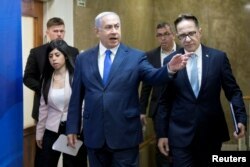 Israeli Prime Minister Benjamin Netanyahu, center, arrives to attend the weekly cabinet meeting in Jerusalem, March 17, 2019. "So, there's always an election," Pompeo said. "We've got an election a year away. They've got one that's less than a month away. I'm going to Israel because of the important relationship we have. Our relationship is between the United States and Israel the same way that theirs is between Israel and the United States. Leaders will change in both countries over time. That relationship matters, no matter who the leaders are." 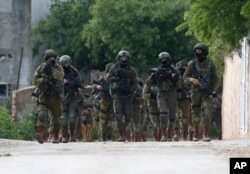 Israeli forces search for a Palestinian gunman in the village of Bruqin near the West Bank town of Salfit, March 17, 2019. The Israeli military says a Palestinian killed an Israeli and seriously wounded two others. Netanyahu is visiting Washington next week for the annual conference of the American Israel Public Affairs Committee, a powerful Jewish lobbying group in the United States, and also could meet with President Donald Trump.Pompeo said the recent U.S. shift away from terminology describing the West Bank and Syria's Golan Heights as "Israeli-occupied" to that of "controlled" by the Jewish state was not accidental. He said that the characterization in a recent State Department report on human rights around the world about Israeli control of the disputed territories "was a factual statement about how we observe the situation. And we think it's very accurate, and we stand behind it." Pompeo said that on his third stop, in Beirut, "we'll spend a lot of time talking with the Lebanese government about how we can help them disconnect from the threat that Iran and Hezbollah present to them. Financial, economic, all the assistance we have provided to the Lebanese Armed Forces, talk to them about those serious issues.And meet with some of the religious leadership of the country, as well." The U.S. considers Hezbollah, a militant Islamist political group, as a pro-Iranian "terrorist" organization, even though it is represented in the coalition government of Prime Minister Saad Hariri, a U.S. ally.